Wärtsilä is to provide a 130 MW Flexicycle planttotheMalicoundapowerproject in Mbour, Senegal, about 85 km from Dakar. The order was placed by Lebanon-based Matelec, contractor to the plant owner/ operator Melec Power Gen, an IPP. Wärtsilä is to provide a 130 MW Flexicycle plant to the Malicounda power project in Mbour, Senegal, about 85 km from Dakar. The order was placed by Lebanon-based Matelec, contractor to the plant owner/ operator Melec Power Gen, an IPP. The project is part of Senegal’s strategy to increase its energy production, while in the medium term, reducing the cost of electricity for consumers. The Wärtsilä plant will provide the flexibility needed to facilitate the integration of intermittent renewables into the country’s grid. In addition, Senegal is exploring energy storage options. The project was initiated in September 2017 with the signing of a development agreement between Africa 50, the infrastructure development fund for Africa, and Senelec, Senegal’s state power utility. Wärtsilä Flexicycle, combining a reciprocating engine with a steam turbine, aims to combine the flexibility of a recip with the efficiency of combined cycle. 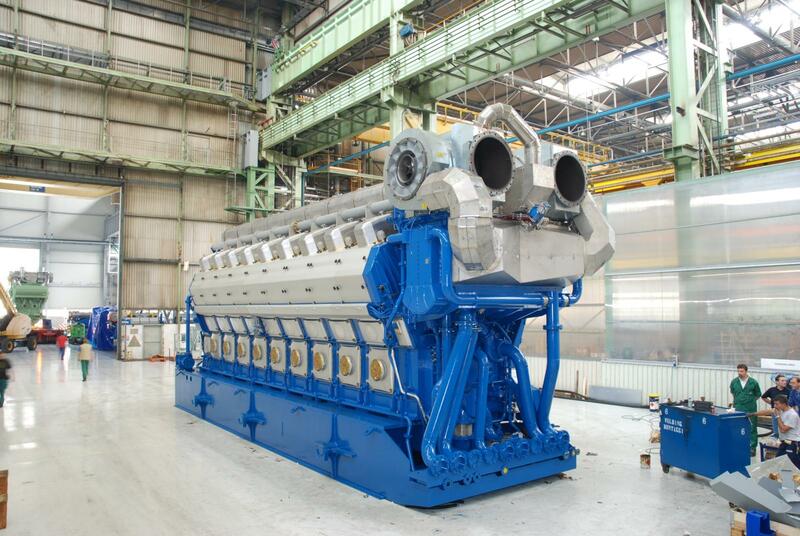 The Malicounda plant will employ seven engines of the Wärtsilä 50 type (pictured left), operating initially on HFO, with an option to convert to gas as soon as it becomes available. Senegal and Mauritania have signed a co-operation agreement to develop substantial gas resources to be shared by the two countries. Together with the Dakar-based Dieng & Co Engineering, BayWa r.e. has commissioned four photovoltaic–diesel hybrid systems in Senegal’s capital. BayWa r.e. assumed responsibility for planning and delivering the components, and also provided on-site support during construction and commissioning. A team from OneShore Energy was also involved in the implementation of the diesel hybrid systems. OneShore Energy, which specialises in off-grid solutions, has been part of the BayWa r.e. Group for over a year.